Another new jacket has landed at my home, this one a deep bottle green, though in truth it’s practically black. 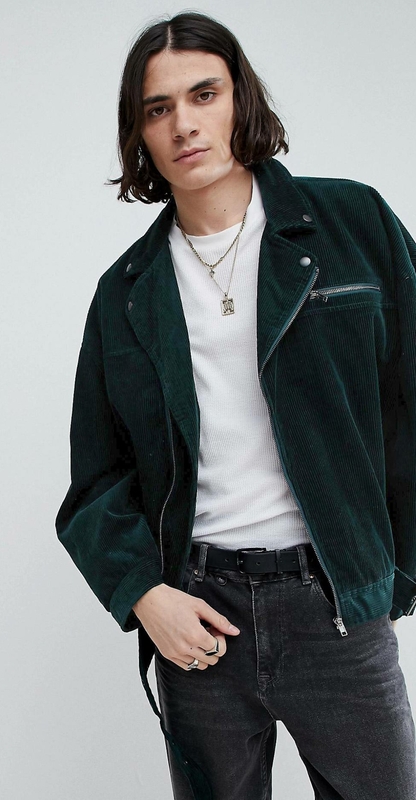 It’s a bikie’s jacket in cord, and looks like something Michael Hutchence may have worn during an INXS photo shoot. It’s deliciously droopy and bad to the bone. Just add your favourite enamel pin to the lapel and you’ve scored. I found it much more comfortable to wear than a normal denim jacket, since it’s heaps softer and warm on a cool day. There’s enough pockets to stash everything, all zipped so that things won’t fall out when throwing it over your shoulder. I have to say that I wasn’t sure about this one, but loved what I saw in the mirror. At just over $60 Aussie dollars you can’t really go wrong here. It’s by ASOS and sold only at ASOS. Mum was often cross with Dad, He was bought up in a very poor family, times were hard and you did whatever you could, and in some ways, even though he grew up, been in the Army, and went to Melbourne to Marry Mum, he never quite got over certain behaviour. While having a hot toddy and English Muffins with Jette at 4am, I thought of this one story which took place years before I was born. Dad came home with this satisfied look on his face like a dog who’d found a massive mouldy bone somewhere and bought it home, only it wasn’t a bone, it was a huge rug rolled up under his arm. “I was given this rug luv, it’s a bit stained but you can wash it and it should come up alright”. It turned out the rug had come from a home where a bloke was either murdered, or committed suicide, his blood was all over the rug. Somehow it just didn’t matter to my Dad, it was a free rug, that was all. Mum was horrified and made him get rid of it, he probably grizzled about it but did as she asked. The things you remember at 4am. On offer at ASOS at the moment is a trench coat which caught my eye a few weeks ago, and I found myself checking it out regularly. I’ve always fancied having one, they either remind me of The X-Files or of a Sax player in an 80s band, which might be hot if you’re thinking of one of the better bands. I also think it’s a great, classic, wolfy look. Picturing the end of my tail just poking out from behind the knees. So what held me back? The price, and that I have bought a few jackets over the last few months, having decided to put more clothes on rather than heat the home with gas, as the winter here has been mild so far, that has been an easy thing to do. But, then they had a sale, which is still on, and the price fell to a much more respectable $58, so I sprung for it. Well it arrived today by express post, so I have had a chance to review it for those who might be hanging off like I was, while it’s still available at its sale price. The trench coat is by ASOS design, so I don’t think you’ll find it anywhere else. It’s Navy blue, as these things too often are, and I really would like to see something in a pale green, pink or something brighter, I love bright colours. But what gives it more appeal is the lining, chequered in light and dark grey with a hint of red, wear it open to flash your colours. The coat looks waterproof, so it should keep you dry right down to your knees, though you’ll need a brolly to keep your head dry in the rain as it lacks a hood. Now, it’s oversized which might appeal to some, but if that’s not for you then you can probably go a size smaller and you’ll be fine, but do take the time to measure yourself just to be sure. My other jackets were bought for warmth, two are borg lined (fluffy woolly stuff) and two are heavily padded, but this one is very thin in comparison, it looks built to keep the wind out, but you’ll still need a jumper for warmth. That isn’t a criticism though as sometimes a light coat is more than enough, it would be the perfect cover when vanishing off into the night. I wouldn’t have bought it at it’s original price, but for $58 it’s a pretty good look!